While I am always seeking to add books to our girls’ library when I am shopping at used book stores or thrift shops, I sometimes have a hard time remembering which books they already have and which ones they don’t. There are various book series that they enjoy reading, a number of which are older books that are more difficult to find. If the girls are with me, they can remember which ones we still need to buy. (Ah, for the memory of an 8-year-old.) Since I can’t rely on my brain, I rely on paper instead. 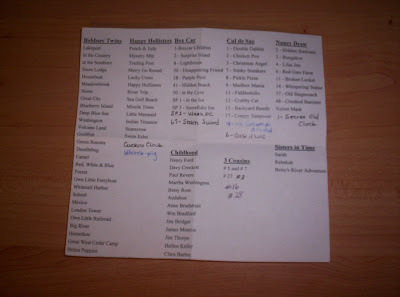 Sometime ago I typed out a list of the series of books we are collecting along with either the title or series number of the books we already own. I keep this piece of paper folded up in my purse. It has come in handy a number of times, especially when I’m shopping alone for books for their birthday or Christmas. I do have to make sure that when I purchase a book, I write it in on the list. Periodically I will re-type the list so that it remains neat and readable. Purchasing good books for our daughters without racking my brain over which ones to buy works for me! Read more tips at Works For Me Wednesday. This is SUPER smart! I need to do this for myself too, not just for kids books. Since I buy a lot of books at Goodwill and yard sales a book list would totally help. The disorganized nature of second hand stores tends to overwhelm me.